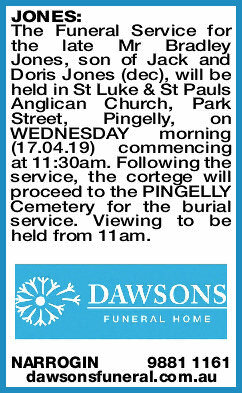 The Funeral Service for the late Mr Bradley Jones, son of Jack and Doris Jones (dec), will be held in St Luke & St Pauls Anglican Church, Park Street, Pingelly, on W EDNESDAY morning (17.04.19) commencing at 11:30am. Following the service, the cortege will proceed to the P INGELLY Cemetery for the burial service. Viewing to be held from 11am.